Designer David Rowland studied at the Cranbrook Academy of Art, the same school which Charles and Ray Eames, Florence Knoll, Harry Bertoia and Eero Saarinen attended.David Rowland began his studies in 1940 under... Read more German Bauhaus teacher Moholy- Nagy, who went on to establish the Institute of Design in Chicago. After receiving a BA in physics and an MA in Industrial Design, he was hired by the man considered the first American Industrial Designer, Norman Bel Geddes. Rowland saw chairs as architecture, art and sculpture. He delved into designing chairs which were more than merely different, but clearly better and easy to mass produce. Something he achieved with the iconic 40/4 chair. Forty chairs could stack within only 4 feet (120 cm) of height with unprecedented density. An elegant design which belied its structural strength. The 40/4, produced by Howe, was indeed his most famous design. It was awarded the Grand Prix at the Milan Triennale in 1964, the Best Piece of Business Furniture in 1965 by The American Institute of Designers (AID), as well as the Australian Gold Medal for Furniture in 1969. Today the 40/4 is on view in design collections and museums around the globe, revered as a modern design classic by prestigiouis institutions the world over. In the process of taking the 40/4 beyond the prototype stage, the road was paved with all sorts of stumbling blocks. Due to his passion and relentless determination, Rowland made his vision a reality in 1964 with its initial launch and has remained in production ever since. Over eight million 40/4 chairs have been sold to date, proof that you need a brilliant idea to create a timeless design. But you also need to believe in it, to produce it. 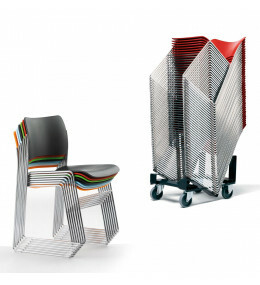 40/4 Stacking Chair is a compact stackable seating solution that's easy to store. 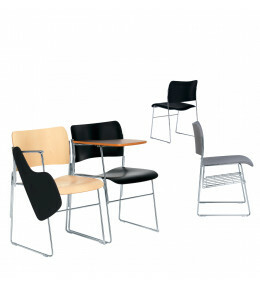 40/4 Chair by David Rowland is high density stacking chair for churches, training and conference areas.